LSM worked with Communications and Collaboration experts Arkadin to develop a year-long programme of customer and client engagement events, combining two of our favourite things – sport and fine wine! The year kicked off with an event staged around wine tasting at the world famous Berry Bros & Rudd. Arkadin invited customers to their inaugural wine tasting event where they were able to network with industry peers and Arkadin’s senior management team whilst experiencing over 300 years of history at Britain’s oldest wine and spirit merchant, situated in the heart of London. Guests tasted some of the finest wines in the venue’s iconic cellars before sitting down to a 3-course gastronomic dinner, with a delicious menu designed to work in harmony with the wines. 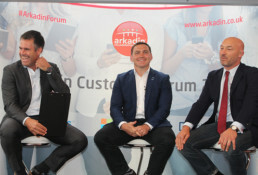 The overall objective of the event was first and foremost for Arkadin to build relationships with its customers, but they also wanted to focus on the vital ingredients, tools and tactics needed to build a high performing team. Looking also at the camaraderie of sport and also the camaraderie of business – and the similarities between the two. LSM worked with Arkadin to create a seamless move into the second half of the event which saw ex-Scotland rugby player, Kenny Logan, lead an extremely amusing Q&A with ex-England players, Trevor Woodman and Phil Greening. Arkadin, as a company, has many characteristics that create a great team such as leadership and organisation, resilience, respect, communication and collaboration. The event was sponsored by two of Arkadin’s partners, Bluejeans and Telylabs, with whom LSM liaised to lend support to the event.